Most of the tropical birds include arthropods in their diet due to nutritional reasons (Morton 1973). Therefore, insectivorous birds are thought to play a key role in controlling arthropod herbivory, thus having positive indirect effects on plants (Hairston et al. 1960, Pace et al. 1999). However, evidence for terrestrial trophic cascades is still fragmentary, and prevalence of such trophic cascades in terrestrial systems is still debated (Schmitz et al. 2000). Several field experiments demonstrate that insectivorous birds can limit arthropod abundances and decrease damage to plants, but these tests have been conducted in settings with relatively low tree species diversity such as temperate forests (Atlegrim 1989, Marquis and Whelan 1994, Murakani and Nakano 2000, Strong et al. 2000) or agricultural systems (Greenberg et al. 2000, Mols and Wisser 2002). Along with high tree species diversity, tropical forests support a high diversity and biomass of leaf-chewing arthropods (Erwin 1982) as well as a high biomass of birds that consume them (Leight and Windsor 1982). But are birds able to limit arthropods even in such diverse system? One body of theory predicts food cascades will occur in terrestrial systems with high plant productivity (Fretwell 1977, Oksanen et al. 1981). Opposing theory predicts that cascades will not occur in such systems (Polis and Strong 1996). Proponents of the latter theory suggest that higher diversity in terrestrial systems leads to diffuse food webs, rendering trophic levels nonexistent (Polis and Strong 1996). Today we know that some cascades exist in systems of both low- and high-diversity. All experiments coping with predation on insect compared control and exclosed (with birds excluded) areas, and most of them have shown that birds can suppress the abundance of and feeding damage caused by folivorous insects (temperate - Atlegrim 1989, Marquis and Whelan 1994, Floyd 1996, Sanz 2001; tropics – Greenberg et al. 2000, Van Bael et al. 2003). Contrary to these studies of the effects of avian predators on folivorous insects, birds failed to reduce significantly the frequency of or feeding damage caused by exposed-feeding insects and by concealed-feeding insect in some works (Sipura 1999, Low and Connor 2003). Possibly, other causes of mortality, such as arthropod predators, parasitoids or host plant defenses could compensate for the mortality lost when avian predators are reduced in abundance (Tscharntke 1992, Marquis and Whelan 1994, Floyd 1996). Intense foraging by ants may be responsible for the generally low abundance of externally feeding herbivores, particularly those that are poorly defended, in lowland rainforests. Such apparently straightforward ‘top down’ effects, where ants limit herbivore abundance can vary considerably among arthropod communities (Rosenheim 1998, Denno et al. 2005). One complication is that top-down effects can be reduced by intra-guild predation (Polis et al. 1989, Finke and Denno 2003) and it is unclear to what extent predation and parasitism by other taxa is complementary to that by ants. For example, caterpillars well defended against predators tend to experience high parasitism in tropical forests (Gentry and Dyer 2002), while reduced predation by ants does not necessarily lead to increased parasitism of their potential prey (Memmott et al. 1993). Experimental removal of parasitoids may produce important effect (Gomez and Zamora 1994) as well as no effects (Price 1990). If we go back to problematic of altitudinal gradient, we already discussed that bird abundances decrease with increased elevation (especially insectivorous birds). Does it have any impact to food webs? Altitudinal trends in the structure of predator-insect-plant food webs are virtually unknown due to the lack of data on trophic interactions in montane forests as ~90% of plant-herbivore studies in the tropics have focused on the lowland rain forests (Novotny and Basset 2005). Similar bias also applies to the study of herbivore-parasitoid webs (Stireman et al. 2005, Lewis et al. 2002, Memmott et al. 1994). Perhaps the most important altitudinal trend in the structure of food webs is in the abundance and species diversity of predators – ants and birds. Ants reach extraordinary abundance in lowland tropical forests, typically representing 20-40% of the arthropod biomass in forest canopies (Tobin 1991, Hölldobler and Wilson 1990), where they exert high predation pressure on other insects (Novotny and Basset 1999, Jeanne 1979, Novotny et al. 2006, Olson 1992). However, ant density and diversity rapidly decreases with altitude to very low levels above 1,500 m (Olson 1994, Bruhl et al. 1999, Samson et al. 1997). Birds decrease with altitude much slowly than ants, thus could play higher roles in predation in higher altitudes. The altitudinal trend in ant and bird abundances is likely to have wide ranging consequences for the structure of plant-insect food webs, because the insect herbivores with which they interact consume up to 40% of plant primary productivity (Lowman 1984), often with significant impacts on plant fitness and ultimately community organization (Fine et al. 2004, Marquis 2004). In vertical space, ants are typically more abundant in canopy samples than are known arthropod herbivores. Moreover, abundances of foliage-gleaning birds were higher in the canopy than in the understory at the same site. Intraguild predation occurred in the canopy food web as well, because birds, ants and spiders consume herbivorous arthropods. But spider and ant predation on caterpillars, if it occurred, seemed not compensate enough to mute the indirect effect of bird predation on inaccessible branches. Because actual predation events are rarely observed, previous studies have used artificial models to evaluate predation pressure (e.g. for caterpillars, Koh and Menge 2006). The use of artificial models permits the testing of specific by experimentally controlling for the effects of other factors, such as prey density. However, this method is subject to many inherent biases (Major and Kendall 1996), chief of which is that rates of attack on artificial models may not accurately reflect actual rates of predation (Berry and Lill 2003, Zanette 2002). Despite the potential limitations, the use of artificial models is a valuable tool for the rapid assessment of relative predation pressure across sites of interest. 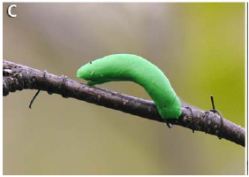 To capture the bite marks of potential predators, artificial caterpillars are constructed using modeling clay, and loosely modeled after a native butterfly species. Because of missing chemical and some optical cues, this method may more accurately represent relative predation rates on prey instead of actual predation rate. Visual cues (color and ring pattern) have been shown to affect predation on artificial millipedes (Brodie and Moore 1995) and snakes (Brodie 1993, Brodie and Janzen 1995, Hinman et al. 1997) by avian predators, and it is likely that chemical cues would affect predation on artificial caterpillars by arthropods. Nevertheless, such predation experiments allow for a standardized, rapid assessment of relative predation rates (Brodie 1993).